The arrogance has left the jazz. There were times when musicians demonstratively turned their backs to the audience and did everything with angular phrasings and harmonic alterations to not be comprehended. Anyone complaining that he could no longer snap his fingers to this kind of jazz was snobbishly told: "Something appears to be wrong with your fingers." Times past. Long ago jazz musicians got rid of their obsessive idea originating from humble beginnings. Again, people fancy dancing to jazz improvisations emphasizing that this slightly different four-four time dates back to the red light districts of American major cities. And more: Meanwhile, lounge is all over the place. To jazz it did no damage. It may even be argued that the resurrected culture of leisure and relaxing made certain styles of jazz popular again: the melancholic cool jazz at the bar mornings at 3 a.m., the casual chant of a Chet Baker sitting on a bar stool photographed in his white vest by Bruce Weber, a combo's soft dinner music in high society restaurants, Stan Getz' elegant bossa nova for all those that propagate flirting as a quality of life. And, of course, the blood supply from pop and rock, a drastic remedy by which jazz wanted to cure its aesthetic anaemia. It started around 1968 the magical turning point which musically will also be remembered as a wild time of radical change. Jimi Hendrix asked the rising pop community "Are you experienced?" only to scream the answer himself directly afterwards with his gigantic third album "Electric Ladyland". Miles Davis prepared himself to quit the narrow circles of jazz rapturing his record company by mixing a witches' brew of jazz and electronic rock while Peter Brötzmann with his "Machine Gun" disguised as baritone saxophone is starting his radical counter offensive. Joni Mitchell produced - with a little help by her friend David Crosby - her gentle debut "Song to a Seagull", while Cecil Taylor rode his bizarre piano attacks together with the Jazz Composers Orchestra. Between the extremes "free jazz" and "folk rock" the knowledge spread that the hostile brothers jazz and rock were more joint than separated: "Fusion" was the spell even though the term was only cast on products of this musical handshake to reconciliation as promotional stickers. Soon this fraternization went so far that at some jazz festivals chamber-musically chiselled jazz with acoustic instruments had to be searched using an ear trumpet - amongst all the roaring of rock and blues, and some observer considered the influence of rock on jazz as a hostile takeover. But however, one choses to look at the encroachments, they created a genre that stayed alive to this day with offshoots like funk jazz, and they have, as it were, transported the free movement of goods between the musical stocks. In this crucial year of 1968, Volker Kriegel released "With a Little Help from My Friends", his first albums under his own name, causing a sensation not only within the scene with his sense for contemporary trends. In the same year, vibraphonist Dave Pike and the guitarist from Darmstadt (who lived in Frankfurt and Wiesbaden later) founded the highly successful Dave Pike Set which opened only three years later at the renowned Newport Jazz Festival, catapulting Kriegel into the first league of European jazz musicians who were also respected in America. The German public which was not exactly committed to jazz took an interest in the new phenomenon as well. Der "Spiegel" was surprised about this "mixture of blues, bossa nova, Bedouin sounds and beat" letting Volker Kriegel go on extensively about why he would prefer not to use the term "jazz" any longer: "It restricts our music way too much. Jazz apologetics will have to get used to the idea that this drawer is stuck." It was a big gun pointed at the ivory tower of avant-garde jazz because what "Der Spiegel" wanted to interpret as an ironic take, in reality was not at all superficial but a more original and at the same time complex revitalization of jazz by other means. In a conversation published by Fritz Rau's "Concert Zeitung" in 1968, Volker Kriegel disclosed his gallery of ancestral portraits. There, Barney Kessel appears next to Attila Zoller, Laurindo Almeida next to Sonny Sharrock and Andrès Segovia next to Toto Blanke. In this article Kriegel speaks about the most beautiful timing of Kenny Burrell, the nicest accords in jazz coming from the instrument of Jim Hall, about the great blues of Jimi Hendrix, the old craftsmanship of Joe Pass and about John McLaughlin who is playing "more exciting and modern than all the other guitarists without involving specific noises." Volker Kriegel was one of the most reflected, most intelligent, most versatile, most capable and most undogmatic jazz musicians in the second half of the 20th century who passed away far too early. What a gentle giant he must have been with 25 years of age becomes consciously clear while listening to his first album "With a Little Help from My Friends". This debut became his calling card where all the guitarists he held in high regards can be found - not copied but referred to. Kriegel had an infallible instinct for phrasing, when it was the right moment to increase tension, when to persevere steadily. He was able to integrate the splinted motifs of free jazz and the lush harmonies of blues perfectly in his linear playing which appeared controlled even in its most ecstatic moments. He was a great stylist and an accomplished technician who never went peddling with his abilities and always listened sensibly to his congenial teammates. He was never afraid of what you could call a beautiful tone and he never flinched from the power of a rock ostinato. And he was always witty like in his cartoons and laconic children's stories he published since the sixties. As a musician as well as a creative artist he was an alert observer of the hard-core political atmosphere in Frankfurt at the time around 1968. His stimulating art is too complex to be reduced to a common denominator. Also due to the fact that his creator never let himself put in front of some aesthetical cart not even if it was such a suggestive one like Teddy Adorno's. Volker Kriegel was multifaceted. He never was a merciless follower, a notorious couch potato neither. It is wonderful that the re-release of a sound storage medium is able to create once again a lasting memory of an artist like Volker Kriegel. 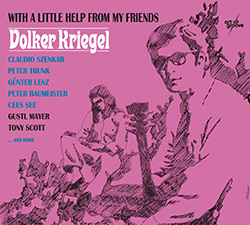 We met sometime during the mid-60's, played together and in 1967, Volker took an integral part in the development of my album DOLDINGER GOES ON. Hence, it was a nearly natural process that I came to produce a part of his own solo album that he recorded in 1968 together with Peter Trunk and Cees See. Both, Peter as well as Cees, have musically enriched me during an essential stage of my life, that under this aspect I am especially pleased to see this Volker Kriegel Trio production released once more. Somehow I have the feeling that this music was recorded only recently. Volker Kriegel was and will be one of the big ones of our jazz scene.